Are you getting a feeling of deja-vu with your swimming? Doing the same things every year and getting the same old results? In this situation you need to shake things up both from a physical and psychological perspective. swimming close to other swimmers. This combination of three different training stimuli is so powerful because each area impacts on the other - e.g. you need good fitness to sustain good technique and your technique needs to be suitable for open water conditions. 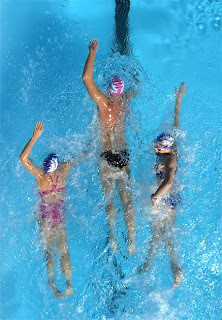 The three sessions work with each other to produce a better overall swimmer. We have around 300 swimmers in the squads and each follow this basic structure. All swimmers make excellent progress with this three-way mix, whether they are a relative beginner, an intermediate or an advanced level swimmer. - Technique elements such as exhalation, alignment, kicking technique and feel for the water require constant re-enforcement during your training week which requires discipline, self awareness and concentration. - Threshold sessions require a sustained high level of effort. Many swimmers shy away from hard work but the ability to sustain a high level of intensity is a mental skill and needs to be practised regularly. As you develop this important skill it actually feels easier to sustain a strong race pace. - Open water technique sessions require you to swim in close proximity to other swimmers so that you can enjoy the huge benefit of drafting effectively in races. The ability to cope whilst being buffeted or occasionally knocked by other swimmers, all the time holding your stroke technique and swimming accurately around the course, is critical to performing well in open water swimming. The key here is familiarity - if you practise this once a week you will feel comfortable during open water races when everyone around you is flustered. Combining these three elements in your training is great fun and adds so much variety to your preparation that you'll never become bored. You'll probably always have a favourite session type but as you get into the other sessions you'll grow to enjoy and appreciate them. Even more importantly, you'll move off that plateau and your swimming will start to move forwards again towards your ultimate potential in the water. If you're wondering how to combine these three elements into your training sessions, check out our Waterproof Training Plans, they make this very easy. Many swimmers struggle with their breathing when swimming freestyle, feeling short of breath and in some cases desperate for air. Let's take a look at an exercise to help your breathing technique become much more effective. Even if you are a more advanced level swimmer this can make a surprising difference so give it a try yourself. Push off from the wall and swim freestyle at a steady pace, taking your first breath after three strokes. Then take five more strokes before breathing and then seven more before breathing. Then return to three strokes, carrying on through the 3-5-7-3-5-7 cycle. 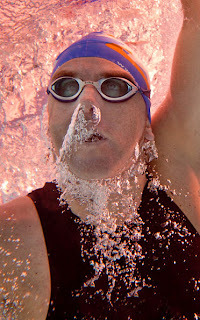 Try this for 100m continuously and make sure you are exhaling smoothly into the water on every stroke between breaths. This shouldn't be forced, relax into your exhalation as if you are sighing into the water. Don't think of the five and seven as longer to hold your breath, instead turn the psychology around and think of it as giving you longer to breathe: specifically longer to exhale! This exercise is a very powerful way to develop a good exhalation technique because it demonstrates to you how much air you have in your lungs and how it feels to exhale properly (during the five and seven). The magic happens when returning to breathing every three strokes: suddenly it feels much easier and more relaxed because you have improved your exhalation during the 3-5-7-3. If you struggle to breathe 3-5-7-3 for 100m, trying using a pull buoy to give you some extra support and reduce the oxygen demand from your kick. Conversely, if you find the exercise very easy try 5-7-9-5! - It rids the lungs and blood stream of CO2, the build-up of which is what leads to feelings of tension or even panic. Blow the CO2 out into the water and your swimming will feel much more relaxed. - It makes swimming more aerobic by improving the gas exchange in your lungs. - It means that when you do go to breathe you only have to inhale, not exhale and inhale in the short window available to you. - It reduces the buoyancy in your chest which helps keep your buoyancy balanced, bringing your legs up higher towards the surface. Exhaling into the water sounds very basic but many swimming coaches (even some illustrious ones) have overlooked how important it is for good swimming technique. If you are a triathlete, try holding your breath for a few seconds whilst running or cycling and see just how bad it feels! Swim coaches have traditionally asked swimmers to take fewer breaths believing that the oxygen deprivation improved their aerobic fitness; this was known as 'hypoxic training'. That isn't the purpose of the 3-5-7-3 exercise, instead we're using fewer breaths over short distances to give you enough time to exhale fully and get the feel of doing so. Give it a go in your next session, you will be surprised what a huge difference it makes to how you feel in the water. A special treat this week: we've edited together a high quality video sequence for you of an amazing swimmer called Jono Van Hazel. Jono epitomises the Smooth Stroke Style used by many elite swimmers. In fact he's so smooth we used his stroke as the basis for our Mr Smooth animation! Jono is a 50m and 100m freestyle specialist from Perth who raced at the Athens Olympics; if you've been on one of our Swim Smooth Clinics you'll have seen his awesome stroke before. We're lucky enough to count Jono as a good friend of Swim Smooth and from time to time he makes guest appearances in our squads (giving the guys in the top lane a very tough workout in the process!). You can see a lot more of Jono swimming (including full underwater footage) and our complete analysis of his stroke in our Catch Masterclass DVD. I've just had a sensational holiday in Esperance, Western Australia with my lovely wife Michelle and our two children. We spent a lot of time on the beach and in the surrounding forests, all without a single ounce of exercise. It was so relaxing and just what we needed after an exceptionally busy year. Is this a thought holding you back too? I've been overwhelmed by emails recently from people saying that they are a little scared to get back into swimming for fear of not being able to keep up with their old training buddies or excel as they would hope. This 'pride in performance' is a completely natural response in all of us but the thing is that whilst you might not be Michael Phelps, I absolutely guarantee that when you return to the pool it won't be as bad as you're telling yourself. Have a read through my "Six Sessions Kickstart" experience back in July 2010 here. This is what you can expect to go through when you return and guess what... it's really not that bad. If you've been using the 'once' word in your head, I think this is one of those situations where it is so important to turn off the brain and just start. Once you're out of the door of your house and actually in the water the rest is easy and you'll soon wonder what all the fuss was about.